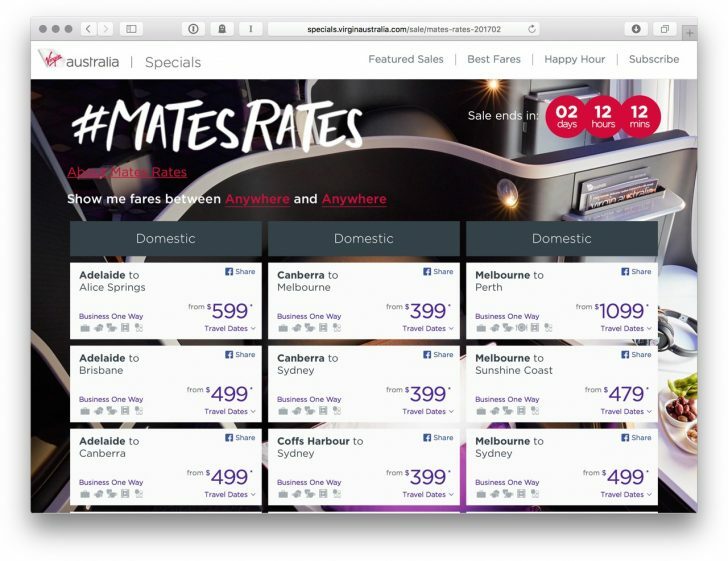 Virgin Australia are offering deeply discounted Business Class sale fares across their domestic network, on sale until midnight Sunday 12th February. Some examples we’ve found include $399 from Canberra to Melbourne & Sydney, $399 for Adelaide to/from Melbourne , or $499 to/from Sydney and Melbourne – we’ve some more examples further down. There’s also Melbourne to Los Angeles available for $5,600. All up, these are some pretty excellent headline prices for Business Class, if you can find availability to suit your dates. You’ll earn the usual Velocity Points and status credits earned for your fare – starting at 5 points per $ for a standard ‘red’ member. For earning status credits, these fares are ideal for booking travel if you have an eye on increasing your Velocity status credit balance in order to hit a higher elite status level in the program. Remember that Velocity don’t tier how many status credits you can earn from your flight bookings in Business Class by the kind of fare you book, so you there is the potential to pick up a decent haul here if that is what you’re after. Do you think the double points offer (listed on this site) from East Coast to LA would pair up with a mates rates promotion??? Melbourne – Los Angeles $5,600 is actually return not one way.